2 Pack Swiss Tech Solid Cast Aluminum Carabiner Micro Light Keychain Only $4.99 Plus FREE Shipping! You are here: Home / Great Deals / 2 Pack Swiss Tech Solid Cast Aluminum Carabiner Micro Light Keychain Only $4.99 Plus FREE Shipping! I’m a big fan of double duty items. This Swiss Tech Micro Light Keychain is just that! 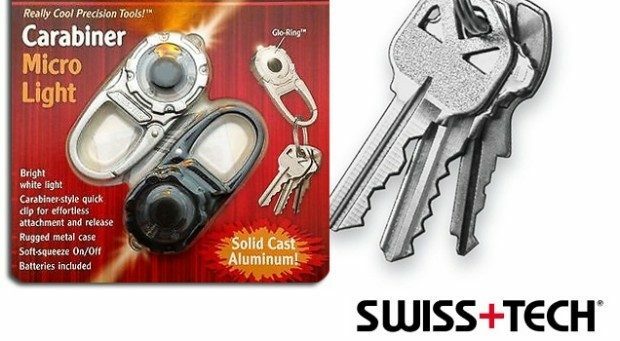 The 2 Pack Swiss Tech Solid Cast Aluminum Carabiner Micro Light Keychain Only $4.99 Plus FREE Shipping keeps your keys together on a really easy to use carabiner clip, PLUS lights the door lock so you can get in your car or house in a snap! There is a soft-squeeze on/off button with a glow ring so you can easily find your keys!